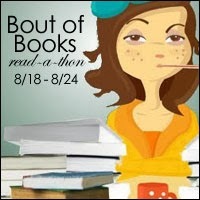 I've wanted to participate in Bout of Books for quite a while but always ended up missing it. Not this time. I'm behind on every reading challenge I signed up for at the beginning of the year, and I'm hoping to make some progress on them during this week, as well as tackle some books that I've been meaning to read for ages but just haven't gotten to yet. Right now I feel like I've got a better handle on balancing my reading time with work and life in general, so I'm going all in and joining a read-a-thon! Gonna give it my best shot, lol!